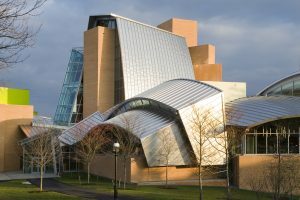 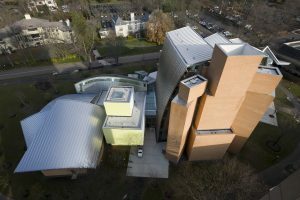 Architect : Gehry Partners, LLC • Contractor : Barr & Barr, Inc. 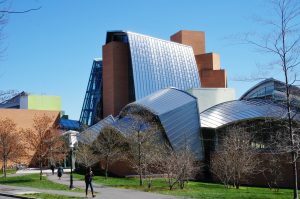 Designed by Frank Gehry, the multi-story, 87,000-square-foot science library combines many of the University’s science collections and technology spaces, and also includes study, research and classroom space. 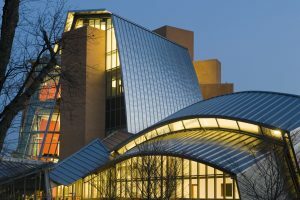 The Princeton library’s exterior is composed of stainless steel, light-colored brick, glass and stucco. 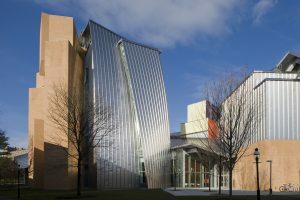 Eighty-eight thousand pounds of stainless steel was imported in coils from the Finnish company, Outokumpu, and then formed into ZIP-RIB panels by Merchant & Evans, Inc.
CMF installed 31,000 square feet of 22-gauge #4 316 stainless steel embossed siding and roofing panels on the building. 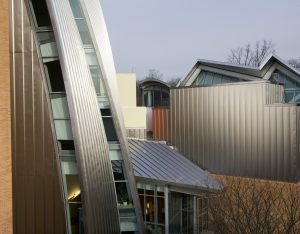 CMF also installed 20-gauge stainless steel copings, radius and straight gutters and miscellaneous sheet metal flashings throughout the project.